$23.773 million on 3653 screens. Although I normally argue that a family-oriented holiday film released in November equals a license to print money, some recent events challenged that belief. 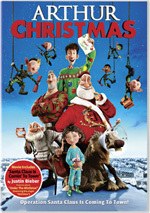 In 2011, Arthur Christmas failed to do much at the US box office, with a take of only $46 million. However, that was a UK production, so I blamed its lackluster American performance on its inherent Britishness. Without a similar factor, it becomes more difficult to explain the situation that greeted 2012’s Rise of the Guardians. Despite a budget of $145 million and a prime Thanksgiving Eve release date, the flick took in a mediocre $101 million. While not a bad total, it’s pretty flat for an expensive holiday flick. Why did Rise fail to find a huge audience? Read on and I’ll get into my theories. We learn of the existence of “The Guardians”, a group of mythical characters who unite to defend the children of the world. This organization consists of Santa Claus (voiced by Alec Baldwin) – here called “North” – as well as the Tooth Fairy (Isla Fisher), the Sandman and the Easter Bunny (Hugh Jackman). With a threat from Pitch (Jude Law) – aka the Boogeyman – the group adds a new Guardian: Jack Frost (Chris Pine). Not all members greet this situation happily, and Jack himself doesn’t seem all that eager to join the gang. We watch the Guardians battle Pitch as well as Jack’s quest to come to terms with his own past. As I mentioned at the start, most family-oriented holiday movies clean up at the box office, but Rise couldn’t find a substantial audience. Why did this happen? My guess is that audiences don’t want to see action-oriented holiday films. Sure, hits like The Santa Clause have action moments, but they’re more comedic/sentimental in nature. On the other hand, Rise attempts some humor and emotion, but it’s essentially an adventure at its heart. That’s not a tone that fits Christmas traditions well. It also doesn’t help that despite the presence of Santa Claus, Rise isn’t actually a Christmas movie. I guess DreamWorks hoped that audiences would see “North” and think it fits the November/December period, but it doesn’t. Indeed, the film takes place in the spring, and Easter is the holiday that receives the most attention – it actually becomes a major plot point. So why in the world didn’t Rise come out in March instead of in November? I suspect it all came back to potential money. 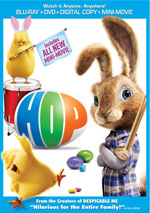 We don’t get a ton of Easter movies, and while 2011’s Hop did okay at the box office, I’m sure DreamWorks figured that the Thanksgiving/Christmas season would allow Rise to make a lot more than Hop’s $108 million. It’s also possible audiences simply don’t want to see a flick about Jack Frost. It does seem odd to base an entire movie around such a minor mythological character, though it least it shows some daring. It’d be easy to focus on “tried and true” personalities like Santa or the Easter Bunny, so I respect the decision to go in a different direction. However, I’m not as wild about all the weird liberties Rise takes with the roles. While I know there’s no “set in stone” versions of the characters, some of the choices seem perplexing. Why is Santa Russian? 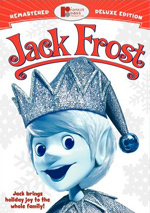 Why does Jack Frost – a character the film portrays as hundreds of years old – look like a member of One Direction? Why are yetis at the North Pole? Why is the Easter Bunny Australian? Why does the Tooth Fairy look like a bird? Why does “The Man on the Moon” rule everything he sees? If Rise came with a more dynamic story or characters, I probably wouldn’t have focused on these questions as much as I did, but unfortunately, the narrative seems forgettable. A lot of that comes from the inherent weaknesses that come with the Jack Frost character. While the movie tries hard to make him seem fun and daring, he simply lacks much personality – he’s little more than a generic semi-bad boy sort with an inferiority syndrome. Pine seems inappropriate for the role. He’s a decent actor, but he comes across as too “adult” for the part. As depicted, Jack looks like a teenager – indeed, he’s supposed to be frozen at age 14 - but he sounds much older, and this disconnect never ceases to distract. Jack looks like Bieber but sounds like Barry White! The other actors seem fine but don’t add a lot to their parts. Ironically, the most charming characters are the silent ones. The Sandman takes on a likable Harpo Marx feel, and even though they rip off the minions from Despicable Me, Santa’s elves provide some weird fun. Still, there’s just something lacking here. The character design seems angular and unappealing, and the execution of the art comes across as plastic and non-organic. The movie straddles action, drama and comedy in a somewhat awkward manner that never does much to satisfy any of those masters. I don’t want to come down too hard on Rise, as I don’t think it’s a terrible film. Even with various flaws, it presents an interesting concept and manages occasional moments of fun and excitement. However, those moments occur too infrequently for my liking. I must admit the movie often feels more like “family entertainment product” than a story the filmmakers really wanted to tell. Rise of the Guardians ends up as a mediocre holiday adventure. Footnote: stick around for some end credits material. Rise of the Guardians appears in an aspect ratio of approximately 1.85:1 on this Blu-ray Disc. From start to finish, the flick looked amazing. Sharpness seemed immaculate. Not a single slightly soft shot emerged in this tight, precise image. No issues with jagged edges or moiré effects materialized, and I witnessed no edge haloes or artifacts. Print flaws also failed to appear. Colors delighted. The movie mixed a variety of palette choices; from warm and sunny to chilly and desaturated, we found a good variety of tones, and the flick always made them look dynamic and full. Blacks came across as dark and dense, while shadows appeared smooth and clear. I felt totally satisfied with this terrific presentation. Though not quite as good, the film’s Dolby TrueHD 7.1 soundtrack also worked very well. With all the movie’s action, the mix gave us many active moments and lots of impressive sequences. Elements like North’s sled and the tooth fairies zoomed around the room, and other components – like Pitch’s nightmares – made strong use of the various channels. These all combined to form a well-integrated soundscape. Audio quality was top-notch. Speech appeared distinctive and concise, without edginess or other issues. Music seemed robust and rich, while effects gave us clean, accurate information; bass response also appeared deep and taut. Everything here worked well to create an “A-“ soundtrack. Rise comes with copious extras, and we launch with an audio commentary from director Peter Ramsey and producers Christina Steinberg and Nancy Bernstein. All three sit together for this running, screen-specific look at cast and performances, story/character areas, visual and character design, score, animation and technical issues. While you'll learn a little about those subjects, you shouldn't expect many insights. Instead, happy talk dominates this commentary to an absurd degree. From start to finish, the participants gush about the great work done and what they love about the film. When Ramsey claimed to be “super-critical” of the movie, I nearly had a stroke. Across the movie's 97 minutes, you’ll find maybe five minutes of actual film-related information – and that’s a big “maybe”. I won’t say this was the most tedious, least enjoyable commentary I’ve heard, but it’s close – I view it as pretty worthless. Under Behind the Magic, we find a collection of four featurettes. With a total running time of 27 minutes, 43 seconds, we see “Dreaming Up the Look” (8:06), “Naughty and Nice: Designing Memorable Characters” (8:39), “Enchanting Effects” (5:32) and “Creating an Epic Score” (5:26). Across these, we hear from Ramsey, Bernstein, Steinberg, production designer Patrick Marc Hanenberger, executive producer Guillermo Del Toro, executive producer/author William Joyce, head of character animation Gabe Hordos, head of story Hamish Grieve, head of effects Yancy Lindquist, visual effects supervisor David Prescott, effects lead Stephen Wood, and composer Alexandre Desplat. The pieces examine character, set and visual design, influences and inspirations, animation and effects, and music. After the painful commentary, “Magic” comes as a relief. While not the most in-depth examination of filmmaking I’ve seen, it covers its subjects well and offers a useful take on the topics. Another featurette called The Man Behind the Guardians goes for six minutes, 25 seconds and includes notes from Joyce, Steinberg, Bernstein, and Hanenberger. We get notes about the development of the novel on which the movie’s based and other aspects of the story/characters. Joyce dominates and makes this an enjoyable view of his work. For the final featurette, Dreamers & Believers fills 10 minutes, 47 seconds with info from Ramsey, Steinberg, Joyce, and actors Chris Pine, Alec Baldwin, Hugh Jackman, Isla Fisher, and Jude Law. “Dreamers” discusses cast, characters and performances. Like its predecessors, it gives us some good info, and I like the shots of the actors in the recording studio. Sandy’s Dream Guide gives us an interactive feature. This presents a variety of potential dream subjects – like parents or castles – and interprets their meanings. It’s a cute addition for kids. Two Blu-ray exclusive games follow. We locate Jack Frost Snowball Showdown! and Rock, Paper, Scissors with Sandy. In the former, you use your remote’s arrows to move Jack around the bottom of the screen to dodge/throw snowballs. Expect a tedious affair. For the latter, you play the old kiddie fave in either single elimination, best of three or best of five configurations. It’s simple and not much fun. The disc opens with an ad for The Croods and Dragons: Riders of Berk. These pop up under Previews along with clips for Kung Fu Panda: Legends of Awesomeness, the Rise of the Guardians video game and Madly Madagascar. Sneak Peek also provides a promo for Turbo. Worlds of DreamWorks Animation throws in musical snippets from Shrek, Madagascar, How to Train Your Dragon and Kung Fu Panda. No trailer for Rise shows up here. A second disc delivers a DVD copy of Rise. It comes with most of the same extras found on the Blu-ray. 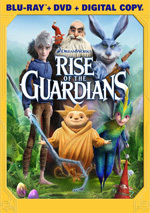 While not devoid of entertainment, Rise of the Guardians lacks consistency and usually falls fairly flat. It gives us occasional enjoyment but suffers from dull characters and a lackluster story. The Blu-ray comes with excellent visuals and audio as well as a decent collection of supplements harpooned by one of the worst commentaries I’ve heard in a while. Rise gives us passable family entertainment at best.